El Escorial, Segovia, Avila, and Toledo are all nearby. Driving in Spain is pretty easy. Just take your time getting out of the city or out of the airport in Madrid… that’s where things can get the most confusing. We've done several driving trips in Spain and I can tell you it's all worth it. ...But to really soak them in, consider renting a car and driving like we did. This loop can take four to five days depending on how long you linger. Combine it with a visit to Madrid, and you have a great week vacation. Drive From Madrid… Not In It! We don't recommend driving in the city, but getting a rental car in town and driving out of Madrid seemed pretty straightforward. We rented ours right in the center of town, and we had no troubles with our drive from Madrid out onto the open road. The sprawling complex of the El Escorial Palace (Real Monasterio de San Lorenzo de El Escorial) worth a stop. 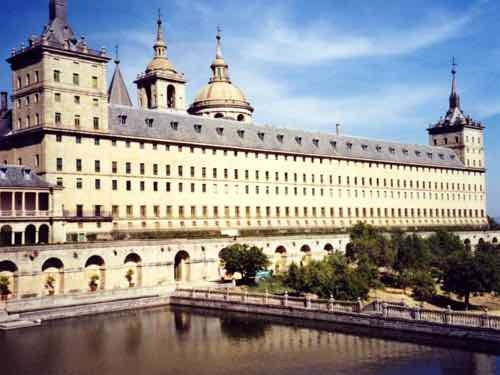 This combination monastery and palace is about an hour drive from the capital in the town of San Lorenzo de El Escorial. There are furnished rooms to visit, and a great library to see. The highlight of this complex is seeing the final resting place of four centuries of Spanish Kings and Queens... the Royal Pantheon. 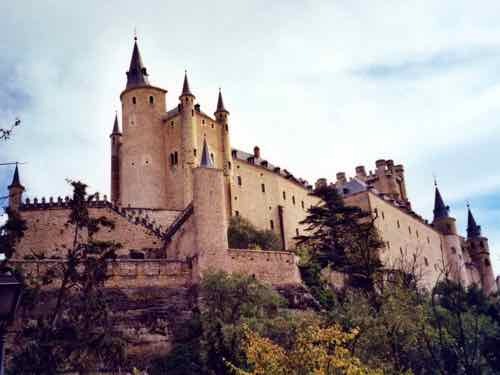 You can make this a mid-day stop, see the palace, have lunch in town or at the Palace cafe, then continue on to Segovia. Segovia is fifty miles from Madrid. This town perches on a hill and represents a couple of eras of Spanish history with both a fairy tale castle and a Roman aqueduct. The town was started by the Romans. 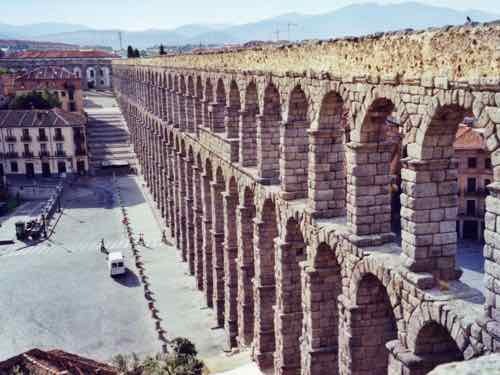 What is left of the aqueduct is 2,500 feet long and 100 feet high. It's double arches anchor one end of the town. Have a dinner of suckling pig (cochinillo asado) in a restaurant next to the arches of the aqueduct. It's a pretty popular place. We went early and had no trouble getting a table. It looks like a fairy tale castle because it burned in 1862, and it was rebuilt in this exuberant style. There are historic furnishings inside and a great view of town from the tower. Segovia is well worth spending a night. Just be aware, it can be crowded on weekends. Parking is scarce, so make sure to secure parking along with your hotel. But if you're into city walls, you shouldn't miss it. The walls are intact, complete with 90 towers. It dates back to the 11th century. The city was the birthplace of Saint Teresa and is an important pilgrimage site. Once you've seen the museum and the Convento de Santa Teresa, head for the city walls. The lively section of town is just outside the main gates. Sit and have tapas and enjoy the view. This former capital of Spain sits on a hill, surrounded by it's city walls and the Tagus River. It's a fun city to wander and get lost in. Trust me, you'll get lost. See the Cathedral and the Iglesia de Santo Tome where El Greco's painting El Entierro del Conde de Orgaz is on view. Discover more of El Greco all over the little city. 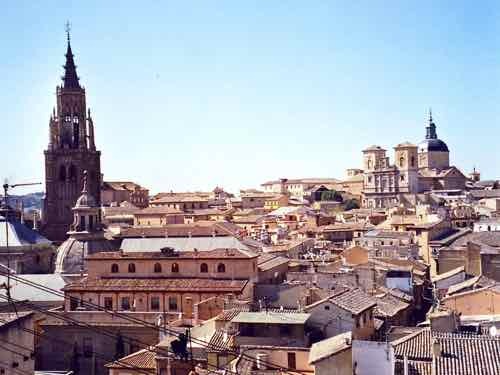 Wandering will uncover bits of Toledo's Roman, Moorish and Jewish history as well. To complete your tour, find a Parador to stay in for one more night before you return your car. Paradores are historic buildings that the government has converted to hotels. We stayed here. 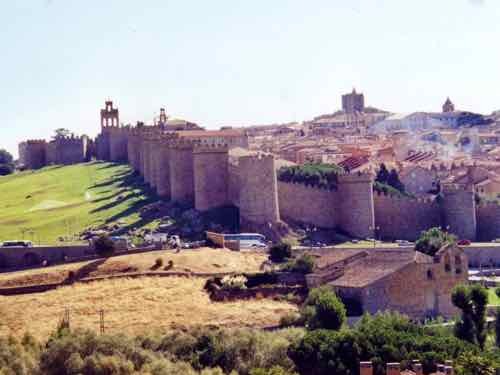 The Siguenza Paradore has a connection to El Cid which you can learn about with a visit. It's a castle turned into a hotel and is about an hour outside of Madrid. From there it was easy to get back to the airport and catch a flight home.